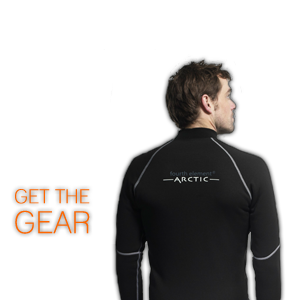 "Thermal protection for both Wetsuit and Drysuit diving." These products are used by professional divers worldwide, from the FBI to the British Antarctic Survey Dive Team. Whether you dive in tropical seas or Polar waters, fourth element has the thermal protection products that you need. This is Fourth Elements newest undersuit. Designed to maximise thermal protection and minimise buoyancy, the HALO 3D has body mapped insulation placed strategically to enhance protection whilst in horizontal trim. Sitting between the Arctic and SubX the HALO 3D is the perfect complement to the current range. Spacetek material blends perfectly with the dual layer construction to provide a constant, compression resistant layer of air on the torso front, thighs and shoulders. The benefit of this additional protection becomes clear, as soon as you enter the water you feel cocooned by the 8mm thick enhanced thermal protection layers. Elsewhere on the Halo 3D, three layers of heavyweight high density, material enhance protection of critical areas. The back, kidney region, buttocks, and hamstring region are protected. Combined with the insulation offered by the Spacetek material, you will feel warmer and better protected. The one piece design is made with functionality in mind, as part of a layer system with Xerotherm. This means that the suit is lower profile around the hips and midriff, allowing maximum manoeuvrability from a simple yet high performing garment with additional thermal protection layers located where they are needed most. The Halo 3D is engineered for those that want the best. The three layer enhanced thermal protection is also located on the inside of the forearms, where the blood flows close to the surface skin. This helps to minimise cooling of the blood before it reaches the hands, keeping the hands warmer.